In my thirty years in childcare I've worked with hundreds of children for the first few years of their life, watching them grow and develop under my care. One of the most important parts of this care is being able to form strong bonds with small groups of children and give each child care and attention. But this week the Government put forward plans that threaten to undermine the quality of this care by potentially doubling the number of children a childcare worker can look after. It already takes experience and confidence to look after four children under five at once, it's almost impossible to look after eight children in a way that is both safe and helps their development. That's why I've started a petition on Change.org to protect the welfare of our children by keeping ratios as they are. Click here to join me. Increasing the adult to child ratios for childcare would limit the opportunities for quality interaction and could impact the wellbeing of children in our care. Like me, many of my colleagues are parents and grandparents too. We understand concerns about increasing child care costs but believe that this move will undermine the quality of childcare without actually reducing the cost to parents. Making carers look after more children will have an incredibly damaging impact on the thing that matters most -- the care of our children. A huge range of organisations including the National Childminding Association and Preschool Learning Alliance agree that these proposals should not see the light of day. The Government is now consulting on these plans, if enough of us speak out we can convince ministers to drop them. 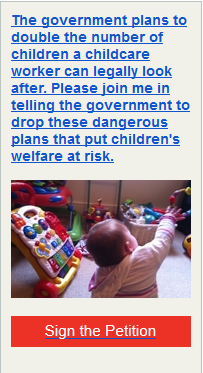 Please join me and sign my petition to keep adult to child ratios in childcare as they are.